20/1/11 – Heritage – Hôtel de la Marine – At the end of his speech expressing his wishes for the New Year to the « world of culture and knowledge » pronounced on 19 January inside the nave of the Grand Palais, the president of the French Republic brought up two subjects currently being debated in the news. 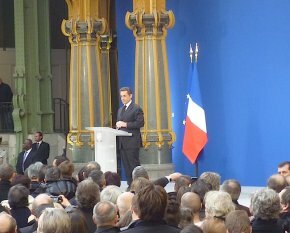 After stating that he found it “rather healthy to debate the issues” and considering that the one concerning the Maison de l’Histoire de France should now cease since the establishment of a Commission d’orientation scientifique, Nicolas Sarkozy turned his attention to the affair surrounding the Hôtel de la Marine and its privatization. Following a touch of humor in which he joked about the presence of the Naval Headquarters at Place de la Concorde, “well known for its seashore” and expressing his surprise that in the past no one had ever been interested in the future of the Hôtel de la Marine  - and also at the “number of phone calls and fiery letters” he had received on the matter, the president stated that he wished to appoint a “commission made up of independent persons to find the best use for the Hôtel de la Marine”. This decision is a victory, the first, for those who have fought for over year against the government’s move to abandon this historical monument to private interests. This confirms the change of attitude by authorities as concerns the building. However, this does not mean the battle is over ; it will be won only when a decision has been made to keep the monument under government control, whatever its ultimate affectation, and to respect all of the recommendations included in the Etude patrimoniale.